Update: If you can find fresh pad thai noodles found in the refrigerator section, they are fantastic! I found them at a Thai market nearby. 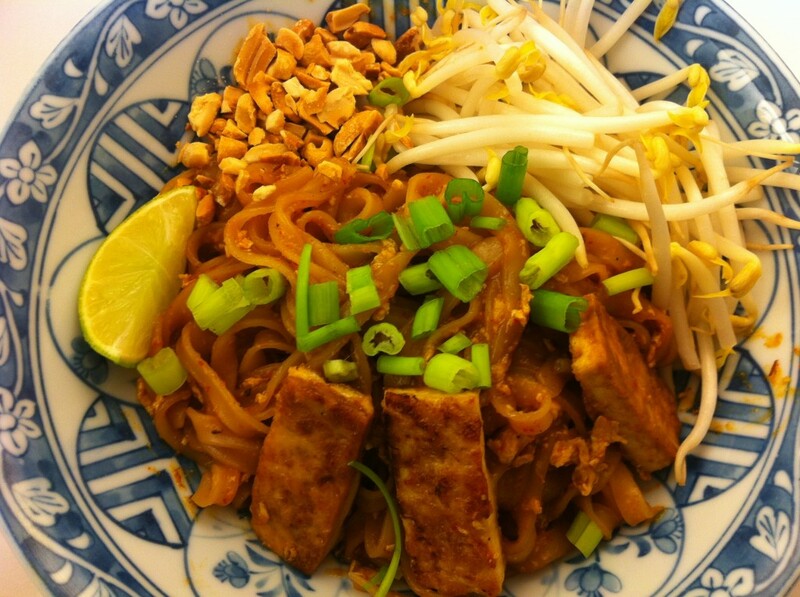 Years ago I found a great recipe for pad thai online that got me started making this amazing Thai noodle dish. Unfortunately, I can no longer find the original recipe, however, I have played around with the recipe ever since so it is probably quite a bit different now than the original! Also, this version is vegetarian. One thing I always have trouble with, and I have probably mentioned this before, is getting rice noodles to come out just right. I have the hardest time getting them soft, but not sticky! And it seems to depend on what noodles I use as well. The ones from Trader Joe’s I find work the best if you soak them in really hot water for a few minutes and then switch them to warm water for 15-20 minutes or so. I had different noodles this time and just soaked them in fairly warm/hot water, but then I ended up having to keep cooking them in the wok because they wouldn’t soften. If anyone has any tips, please let me know! In the recipe below, I used the most common instructions I have found: soak in warm water for 15-20 minutes. I wish I knew the measurements for the sauce but I just throw these ingredients into a pan, taste over and over again to get a balance of spicy, salty, tangy, and sweet. I use Maggi Seasoning, water, and salt, instead of fish sauce (Maggi has so much flavor that I don’t want to use too much of it). The end result should be quite strong, very salty and tangy, and sweet and spicy according to your taste. Mix a little of all the ingredients in a pan and start to heat. Taste and add more of this and that to get the flavors how you like it. Make it stronger/richer than you would think as it has to flavor all the noodles. Bring to a boil then turn off the heat. Soak noodles in warm water until they are soft and pliable but not gooey (15-20 minutes). Heat oil in a non-stick skillet over medium heat and add tofu. Sprinkle with salt. After the tofu has lightly browned on one side, flip it over and lightly brown the other side. Remove from heat. Add eggs and lightly scramble. Add the rice noodles and some of the sauce and stir constantly to get the noodles cooked. Continue to add sauce and a little water if you need to. Once the noodles are to the desired softness, toss in the tofu and the bean sprouts and stir. Taste to make sure there is enough sauce. Serve the noodles with the peanuts, green onions, and lime wedges.